The At-Turaif District in ad-Dir’iyah encompasses the remains of a traditional human settlement developed in a desert environment, dating from the 15th century. 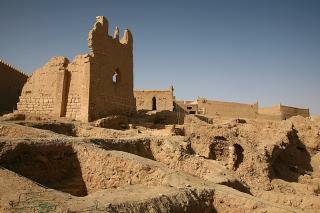 It consists almost entirely of mud-brick structures. 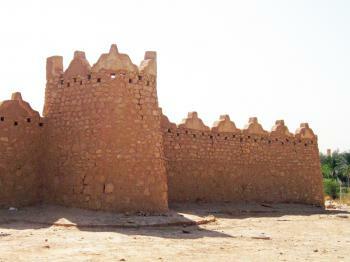 They are a unique example of the Najdi architectural and decorative style developed to cope with the extreme desert climate. Diriyah was the original home of the Saudi royal family, and served as the capital of the first Saudi dynasty from 1744 to 1818. The Turaif Quarter in Al-Diriyyah is not the easiest World Heritage Site to access, as I found when I visited in fall 2012. The quarter is located in the valley of Wadi Hanifa, northwest of the city of Riyadh, and it was the first capital for the Saudi royal family. The green of the wadi was refreshing, but I really wish I'd been able to see more of the mud-brick structures composing the old capital. Unfortunately, the Turaif Quarter was undergoing restoration during my visit, and I was unable to enter through all the construction. Instead, I had to resign myself to viewing the quarter from a section of the old city wall located within the buffer zone at the top of the valley, and to driving on the road alongside the quarter in order to watch the restoration work in progress. The old city wall did provide an up-close view of mud-brick construction similar to other buildings within the quarter, which was some consolation for only being able to view the inscribed area from the outside. Additionally, there was a visitor center near the wall with a map and information about the inscribed area. Logistics: A car is necessary to reach the Turaif District in Al-Diriyyah. The impressive National Musuem of Saudi Arabia in Riyadh also has good historical background information. 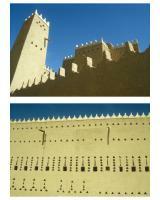 Al-Diriyyah is the ancestral home of the Saudi royal family/clan and is situated a few miles from Riyadh. It was destroyed in 1818 when the Ottomans invaded Arabia. Even when the Saudi family regained control of the area it remained ruined - possibly due to the Wahhabite fear of idolatry of old things which has led to much of Saudi Arabia's tangible heritage being destroyed. (Ref Fatwa 16626, issued in 1994 by `Abd al-`Aziz which reads in part: "It is not permitted to glorify buildings and historical sites. Such action would lead to "shirk" because people might think the places have spiritual value.") In fact the place is significant as the location where Wahhabism was "born". To quote Wiki "In 1744, Ibn Saud took in a fugitive religious scholar named Muhammad ibn Abdul Wahhab, who hailed from the town of Al-Uyaynah, lying on the same wadi some 30 miles upstream. Ibn Saud agreed to implement Ibn Abdul Wahhab's religious views, and what later became known as the First Saudi State, with its capital at Diriyah, was born." As elsewhere in Saudi Arabia a completely new town has been built nearby and for the most part the ruins lay untouched. A resoration project had been started however by the time we visited in 2002 and some buildings showed the results in their pristine mud walls (photos). Nevertheless much of the site still consisted of ruins and contained some atmospheric alleyways and ruined houses. Our visit was limited to external views though some of the restored buildings include palaces and mosques. As always in Saudi Arabia the "Unbeliever" gets to see a very limited range of sights (indeed will meet relatively few "Saudis" as all the work you are likely to be involved in seeing will be done by immigrants apart from a few Saudis sitting behind desks in museums or hotels doing very little!). But, if you have gone to Saudi as a tourist, as we did, everything is going to be so strange anyway - it was early on in our trip and my wife was still getting used to her black Abaya!! In all honesty, the "Chopping Square" in Riyadh which we had seen earlier that morning (Although there was no "Chopping" going on then and the grill down which the blood from amputated hands flowed was clean enough) was of more interest. But - on reflection it was nice to have seen Al-Diriyyah to put some "flesh" onto the bare bones (no pun intended!!) of Saudi history. ICOMOS advised a Deferral, in need of improved Comparative Study, Management Plan and conservation. ICOMOS advised Deferral, to "Make the comparative study more thorough; .. Abandon the current policy of reconstruction and cultural interpretation of the remains on the property and adopt instead a conservation policy the priority of which is the safeguarding of the property’s attributes of architectural integrity and authenticity"
Destroyed during invasion: From Wiki "....led to the Ottoman-Saudi War of 1811?1818 and an invasion of Arabia by Ottoman and Egyptian forces brought the Saudi state to an end in 1818, with Diriyah capitulating after a nearly-year-long siege. The leader of the invading force, Ibrahim Pasha, ordered the destruction of Diriyah. However, when a member of the local nobility tried to revive the Wahhabi state in Diriyah, Ibrahim ordered his troops to destroy the town even further and set whatever was left of it on fire. When the Saudis revived their fortunes in 1824 and again in 1902, they made their capital further south in Riyadh, which remained their capital ever since. Sieges and Battles: From Wiki "....led to the Ottoman-Saudi War of 1811-1818 and an invasion of Arabia by Ottoman and Egyptian forces brought the Saudi state to an end in 1818, with Diriyah capitulating after a nearly-year-long siege. The leader of the invading force, Ibrahim Pasha, ordered the destruction of Diriyah. However, when a member of the local nobility tried to revive the Wahhabi state in Diriyah, Ibrahim ordered his troops to destroy the town even further and set whatever was left of it on fire. When the Saudis revived their fortunes in 1824 and again in 1902, they made their capital further south in Riyadh, which remained their capital ever since. Built in the 18th century: "The site illustrates a significant highpoint of settlement in the central Arabian plateau in a desert environment when in the mid-18th century the town of ad-Dir'iyah became the capital of an independent state" (Crit V justif). "Founded in 15C ...its development reached an initial apogee in the 16th century.. In the 18C and early 19C,..it became the centre of the temporal power of the House of Saud... In the 18C successive imams ..fortified the oasis ..This was a period marked by urban development and the construction of the citadel of at-Turaif. In the second half of the 18th century and at the start of the 19C... The urban ensemble linked with the oasis was developed, particularly the Salwa palaces in the citadel of at-Turaif... The site provides a very full account of Najdi town-planning from the mid-18th century until the start of the 19C." (AB).